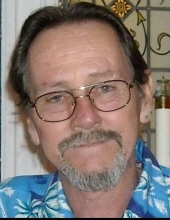 Peter E. McWilliams, 61, of East Moline passed away May 24, 2017 at Genesis Medical Center Illini Campus. Per his wishes there will be no services and he will be cremated. Quad Cities Cremation Center is assisting the family with arrangements. Peter was born May 8, 1956 in Rock Island, IL the son of Joseph and Dorothy Patton McWilliams. He married Cindy Johnson, they later divorced. He then met the love of his life Jimmie Jo “JJ” Belman. Survivors include his mother Dorothy Harkey; companion JJ Belman; son Nathanael McWilliams; grandchildren Kyle McWilliams, Chelsea McWilliams; Nathanael Almanza; great grandchild Hunter; sisters Judy (Sam) Seals and Mary Williams; brothers Joseph (June) McWilliams and Louis McWilliams. Peter was preceded in death by his father; sister Dorothy June Hollingsworth; brothers William McWilliams and Gene Paul McWilliams. To plant a tree in memory of Peter McWilliams, please visit our Tribute Store. "Email Address" would like to share the life celebration of Peter McWilliams. Click on the "link" to go to share a favorite memory or leave a condolence message for the family.